Are you ready for summer? If you live in a small or high-rise apartment, you’ll know how uncomfortable it can be when the thick, blistering heat of summer sets in. If you’re looking to alleviate the humidity or heat, it may be worth considering investing in an apartment air conditioning system. Here’s everything you need to know about apartment air conditioning options, including split and ducted air conditioning for apartments. What are the best apartment air conditioning options? What are the advantages of portable air conditioners for apartments? Portable air conditioners are inexpensive and suited to small spaces. As expressed by their name, they are highly portable and can be moved to different rooms in your apartment at will. They are ideal for people who rent and require an effortless setup with no drilling or installation. What are the disadvantages of portable air conditioners for apartments? Unfortunately, portable air conditioners are less effective at cooling than split or ducted air conditioning systems. In general, portable air conditioners struggle to cool average to large spaces, making them expensive and ineffective to operate on very hot or humid days. In order to feel the cooling effect, you will need to sit close to the unit. Due to their construction, portable air conditioners are also noisier than other air conditioners, which can make them distracting when trying to sleep, having a conversation or trying to watch the television. Portable air conditioners create condensation, which is collected in a drip tray. This means that you may need to regularly empty out this tray to stop water from escaping onto the floor. What are the advantages of ducted air conditioning for apartments? A ducted air conditioner is ideal for a large apartment with multiple rooms. Centrally controlled with a thermostat, it allows you to maintain an even temperature throughout your apartment. This style of air conditioner is the most efficient design on the market, making it perfect for buyers who are conscious of energy usage and eco-friendliness. A ducted air conditioning system delivers cooling into your apartment via concealed ducting through vents. For example, the slimline ducted air conditioners by Daikin are designed to offer quiet, efficient climate control and can be installed in a narrow ceiling space or under the floor. Depending on your chosen model, certain ducted air conditioners offer a zoned system, which enables you to potentially cool different rooms to different temperatures. Ducted air conditioners are available as reverse cycle units, which can heat your apartment in winter. With this style of air conditioner, you can avoid the cost of purchasing a separate heating system. What are the disadvantages of ducted air conditioning for apartments? Ducted air conditioning is generally more expensive than both portable and split system air conditioners. They are ideal if you own your apartment and plan to stay there for a long time. Although they require more cost up-front, you will likely recoup the costs of your investment within a few years with energy savings. If you own your apartment, a ducted system adds to the value and future marketability of your property. A ducted air conditioner can only be installed in apartments that have adequate space for ducting. They likewise cannot be installed in multi-storey apartments. What are the advantages of split air conditioning for apartments? If you have a small apartment, don’t despair. 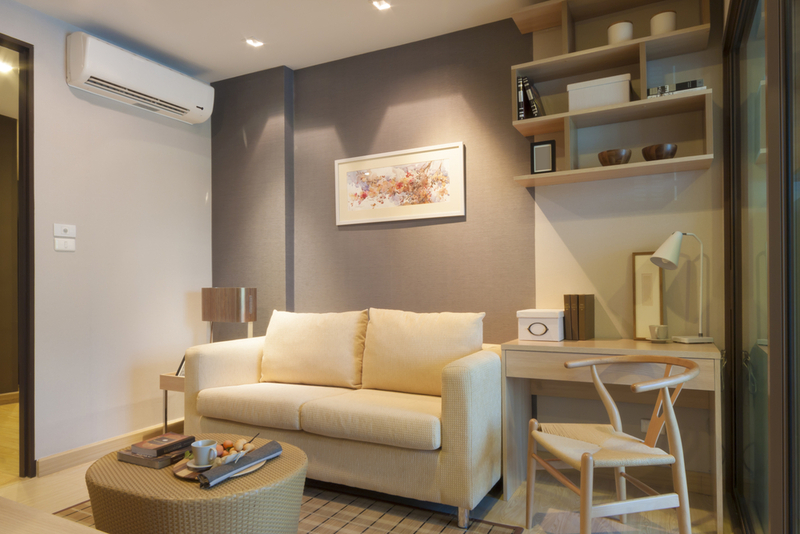 A split air conditioner is ideal for a small apartment with an open plan area of up to 60 square metres, and apartments that have multiple storeys. This type of air conditioner is less expensive to purchase and install than a ducted air conditioner. A split system air conditioner is typically operated by remote control, making it easy to control the room temperature from anywhere in the room. What are the disadvantages of split air conditioning for apartments? A split air conditioner requires you to locate a condenser unit outside your home. While a reputable installer will always make an effort to locate the unit as discreetly as they can, it isn’t always possible to conceal them entirely. If you need to locate the unit in a conspicuous place, you may need to spend extra money on screens or plants. They can also make it more difficult to decorate the interior of the room where it is located. Ceiling and bulkhead-mounted units can help you minimise these risks. A split system’s capacity to cool is restricted to a single room or zone. If you need to cool more than one space, a multi-headed split system is likely the best option if your apartment has limited space for a ducted air conditioning. What do I need to consider when seeking to install air conditioning in high rise buildings? Ensuring your air conditioner suits the size of your apartment is very important. Air conditioning units with a large cooling capacity will naturally use more energy to run, while small units will not cool the room properly. We recommend hiring a professional to measure the square footage of your apartment to figure out how powerful your air conditioner needs to be. Most high-rise apartments have the outdoor air conditioning unit mounted on the balcony. In some circumstances, your air conditioning installer may be able to mount the outdoor unit off the balcony. Depending on the layout of your apartment, it may also be possible to run piping in cupboards or behind furniture. Most local councils in South East Queensland have noise restrictions relating to the use of air conditioners. Before choosing an air conditioner, check both your council’s regulations and your strata rules, especially if you plan to install your air conditioner outdoor unit near a neighbour.